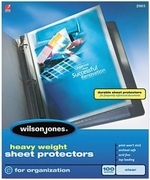 These heavy weight sheet protectors are durable polypropylene document sleeves, providing the ultimate protection for your important papers. The nonstick coating prevents ink from smudging or rubbing off. They are top loading for ease and they are acid free and archival safe.